Under the provisions of the service pack hosting which customers are using. Customers may only be allowed to upload up database file (.sql, .sql.zip) is 50Mb when the Upload and Import implemented interface database from phpMyAdmin . 6) Here customers recheck your information and click on Import Import to process the operation. 7) After importing the report succeed clients please visit the phpMyAdmin to check the data, and connect to your website. 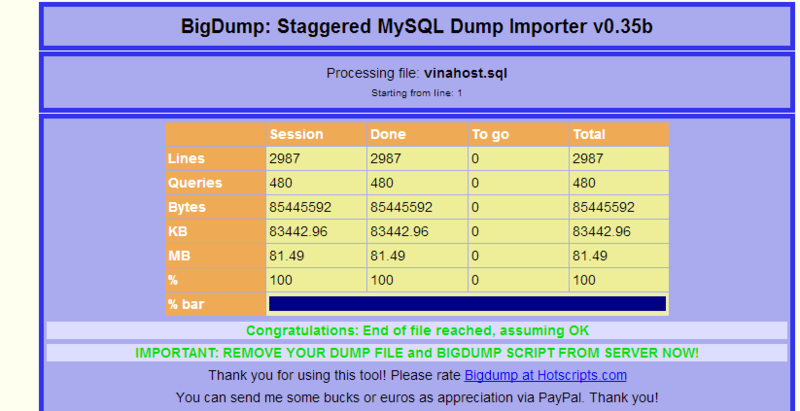 Note for customers: Tool bigdump This allows customers to upload and Import directly to the database file from the local computer to the hosting but for convenience customers to upload database files to the hosting and then Import this will Import process takes place faster and more convenient.